A few years ago I photographed a wedding that was supposed to be at the Japanese Garden but rain moved the ceremony up to the Restorative Garden so I was elated when Missy contacted me about photographing their wedding in the Japanese Garden at the Cleveland Botanical Gardens. Missy and Frank had a beautiful day without a drop of rain so it all went as planned! It was a pretty hot and humid day for May but it was a beautiful day none the less. 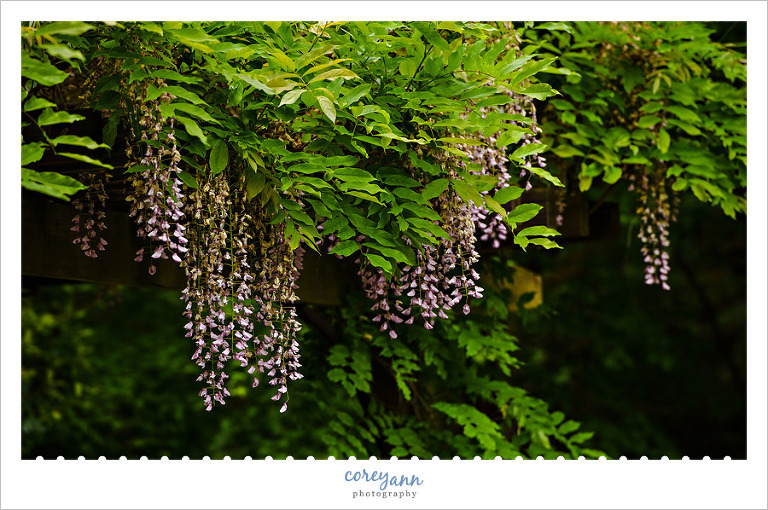 The sun was shining, the birds were chirping and the sweet smell of wisteria was in the air. I loved how Missy and Frank braided their children into the ceremony and made them a part of the ceremony. It was a sweet and personalized ceremony for them and their new family. After the ceremony they moved up to Woodland Hall for their lunch reception where all the kids had tons of fun munching on some kid-friendly food they had alongside the “adult” offerings (and even the adults tried it because everyone was raving about the mac and cheese and who can pass up mac and cheese?) while they raced in and out of the photo booth. The adults mingled with friends and family and it was such a perfect day for everyone. I love casual receptions! Thank you so much for trusting me to capture your wedding day! 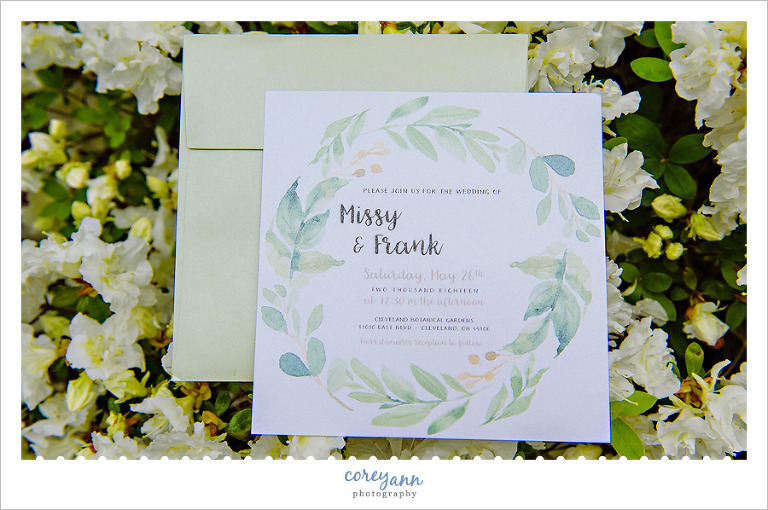 How gorgeous is their invitation? I love the watercolor feel to it! 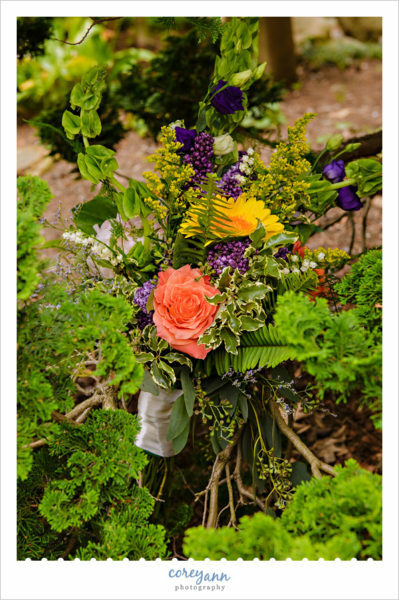 Hirts Florist did an amazing job with Missy’s bridal bouquet! It was stunning! The wisteria is so beautiful in the Japanese Garden! Missy entered the ceremony from the stairs where she was escorted by her Dad and Stepdad, which I loved. At the base of the stairs she was met by her sons and handed off to them for the rest of her walk to the ceremony. What a stunning setting for an outdoor wedding ceremony in May! Missy’s son who was in charge of the bouquet was an absolute hoot through the whole ceremony. 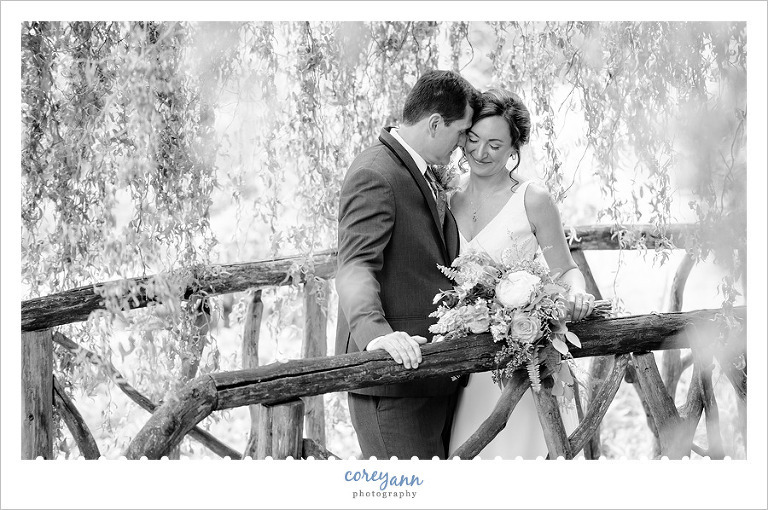 The ceremony with Divine Weddings by Diane was equal parts sweet and sentimental. Then they each gave vows to each others children and it was so lovely. Then they finished up the ceremony with a wine box. Frank joking where Missy can put the key LOL. As always, the moment after the kiss is often my favorite. Just after the ceremony they paused after walking down the aisle for a quick photo with all of their guests. How amazing are the azaleas behind them?! While everyone made their way towards the reception at Woodland Hall we meandered the gardens and took some photos. Near the kids treehouse we discovered this amazing bridge! I loooved it. I love how the back of Missy’s gown had this flower and small train. This cake! Oh this CAKE! Wild Flour Bakery hit it out of the park with this gorgeous spring floral cake. The afternoon started off with some toasts to the newlyweds. Then everyone mingled, ate, took photos in the photo booth and had fun… as you can see below. Once everyone was fed and happy we went outside to do some family portraits near the Restorative Garden. While we were waiting for everyone to gather I captured this beautiful photo of Missy. She was so pretty I had to ask her to smile for a posed version. Frank got his moment as well. They cut the cake and it was perfection, of course! After the reception wrapped up we headed out into the gardens for a few final photos before I left for the day.